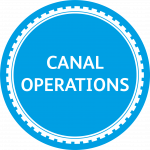 We are currently undertaking investigations into a number of our assets across the canal network which will shape future projects. We are currently undertaking investigations to gain a better understanding of grading, stability, existing information, Planned Preventative Maintenance and defect resolution of a number of our assets across the network. These investigations will determine what course of action needs to be taken to manage or improve these assets and shape our future projects.